The Palestinian Interior Ministry in the Gaza Strip has reported, on Thursday afternoon, that two Palestinian security officers, and two gunmen, including one believed to be behind the assassination attempt of Prime Minister Rami Hamdallah, were killed, during gun clashes in the Nusseirat refugee camp in central Gaza. The Palestinian Interior Ministry identified the two security officers as Ziad al-Hawajri and Hammad Abu Sweih. 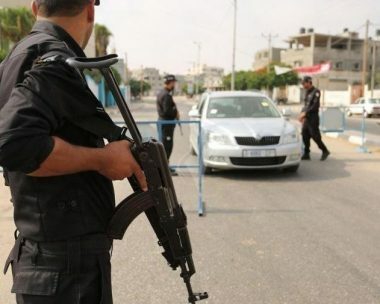 Eyewitnesses said dozens of security officers surrounded a home in the refugee camp, where the gunman Anas Abu Khousa, the man believed to be behind the assassination attempt of Rami Hamdallah, on March 13, barricaded himself, along with several other gunmen. Abu Khousa and another gunman, in addition to two Palestinian security officers were killed in the gun clashes, and one gunman was arrested. The Palestinian security forces also surrounded a home in Zawaida village, in central Gaza, and exchanged fire with several gunmen. It is worth mentioning that the Interior Ministry in Gaza had announced a $5000 reward to any person who provides credible information about the location of Abu Khousa. It said that its security forces managed to locate the hideout of Anas Abu Khousa, and initiated a campaign, on Thursday morning, west of the Nusseirat refugee camp, before surrounding several wanted gunmen, including Anas. It added that after ordering the gunmen to surrender, they initiated gunfire at the security forces, killing the two officers. The Ministry stated that Abu Khousa was killed when the security forces responded to the gunfire, while one of his close aides, identified as Abdul-Hadi al-Ashab, was seriously injured, and died from his wound at a local hospital. The Ministry added that it will continue the investigations to reveal all aspects of the assassination attempt that targeted Hamdallah.